Since you use your Mac on a regular basis, it has most likely become a treasure box full of your personal information that you might wish to keep as private as possible. This may especially ring true for your portable MacBook that you bring around different people and use in various locations, but is also applicable to your desktops Mac that others may use when you’re not around. Whether you just bought a brand new MacBook or are tethered to a long-lasting Mac Pro, security should be a priority. Here are a few tips for keeping your Mac secure and making sure your personal data stays away from prying eyes. To really keep your Mac secure, you absolutely have to use a complex and unique account password—and you should set parameters that require users to enter this password whenever possible. Start by going to System Preferences > Users & Groups. From there, select your account, and then click the option to change your password. In the panel that appears, you’ll see a small button with a key in it. Clicking this will bring up the password generator tool, which will give you various options for passwords you might find useful, and give you a feedback gauge for determining how robust it is. Recently, analytics group SplashData released a list of 2014’s most common and insecure passwords, so if your password choices are among them—or conforms to similar common patterns and phrases—then consider changing it to something more unique. Set your system to require a password immediately when waking from sleep or screen saver. This will ensure you can toggle the screen saver quickly. Once you have a good password in place, ensure it properly locks your system when you step away. Typically, this happens automatically when you log out of your account—you’ll be prompted to enter your password when you want to use your Mac again. However, OS X has a few options that allow you to do this quickly, and without interrupting your workflow. Screen Saver password: The easiest way to lock your Mac is to require a password immediately after waking up from Sleep mode or interrupting its screen saver—and also putting your Mac to Sleep or turning on your screen saver whenever you leave your system. 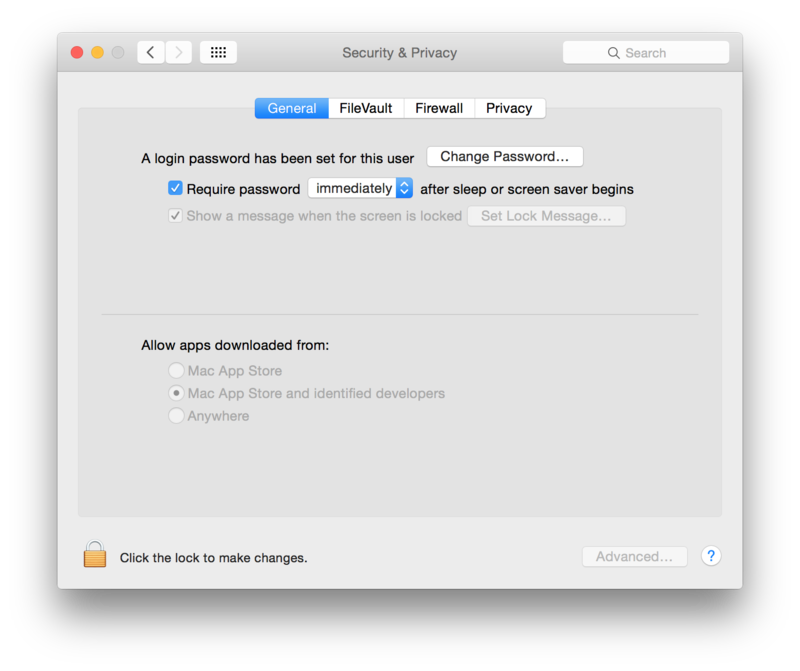 You can set this by going to System Preferences > Security & Privacy > General, and checking the option to require a password with “immediately” as your time frame. When done, you can invoke Sleep either from the Apple menu, by closing your MacBook’s lid, or by briefly pressing its Power button. For the screen saver, you can set up a hot corner in System Preferences > Desktop & Screen Saver—then all you have to do is move your cursor to that corner to start the screen saver. The login window: If you use a shared Mac—perhaps among family members—another approach is to use the login window, which gives you an easy way to lock your account while allowing other users to access their accounts. OS X is perfectly set up for this, since it enables fast user switching by default. This is available in the User menu, which is housed under your in the Menu Bar. The Keychain Menu: OS X includes a status menu for your keychain—just as it does with features like your Mac’s volume and Wi-Fi options, found in the Menu Bar—which can be used to lock your keychain and your screen (without activating the screen saver). To use this menu, open the Keychain Access utility and check the “Show Keychain Status In Menu Bar” box in the General section of the program’s preferences. You’ll then see a new menu that looks like a lock in your Menu Bar, which you can access to quickly lock your screen when you leave your system. System Sleep: By pressing Option-Command-Eject (or the Power key if you do not have an Eject button), you can put your system immediately to sleep. Alternatively, you can use the options in the Apple menu, close the lid of your laptop, or press and hold the power button for three seconds to bring up the Power menu. Putting your system in Sleep mode will save a little power or battery life. The Display Sleep hotkey: By pressing Shift-Control-Eject or the Power key, you can put your Mac’s display to sleep while keeping the system running. As with the other options I mentioned, this will force you to supply your password to resume work. This approach is good for saving a bit of power without powering down completely. Password requirements can lock your system, but that doesn’t really address the concerns you might have when you have to surrender your Mac to someone else—like if you’re having it repaired (even by reputable servicemen at places like an Apple Store). Set up a dedicated account for administrative uses, that you can supply to a technician, if access is needed. 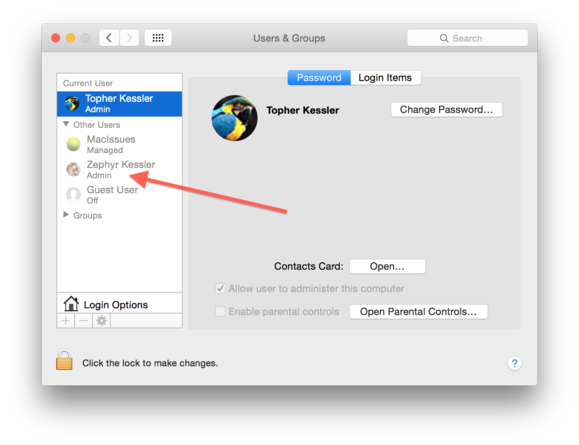 Since 90 percent of your Mac’s content is the experience displayed in your personal account, consider keeping dedicated accounts for both guest users and administrators to keep your own settings and Keychain passwords protected. You can set both of these up by going to System Preferences > Users & Groups. If you set up a separate administrative account, you won’t need to log into it every time to change anything—you can just create it, save its password for use, and then authenticate for administrative purposes using your new admin account. You can optionally demote your main account from being administrator, which is recommend for additional security. Finally, consider protecting your Mac’s hard drive and the computer itself. Even with robust OS X passwords in place, your drive can be removed or otherwise accessed directly in Target Disk Mode if you don’t have encryption set up—which means its data could be copied without restriction. 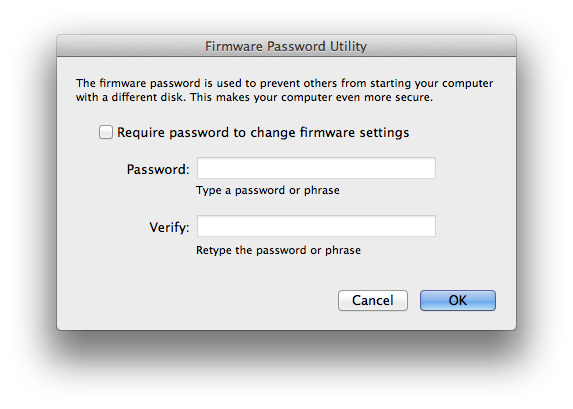 To prevent this, you should first enable FileVault encryption on your drive, and then enable a firmware password. 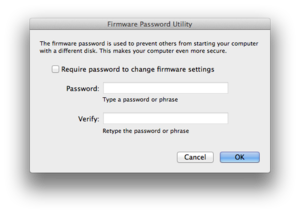 Set a firmware password in the Firmware Password Utility, available from the Utilities menu when you boot your Mac into Recovery Mode. FileVault will ensure that your entire drive’s contents cannot be read without first supplying a valid password, and a firmware password will ensure that your Mac cannot be booted into alternative boot modes that would bypass OS X’s built-in security (things like Single-User mode, Target Disk mode, and to alternative external boot drives). For hardware security, there may be some limitations—for example, Apple has done away with Kensington lock holes on many of its systems—however, you can still purchase a number of third-party locking devices that will secure your system either by a clamp or cable.